Canada is a vast nation. What a feat Canada’s first Prime Minister, Sir John A. Macdonald was faced with, when he decided that Canada should be united by one railway: the Canadian Pacific Railway. Spanning from Montreal, Quebec in the east to Port Moody, British Columbia in the west, it was considered absurd at that time - especially the routing through the Canadian Rockies. It is exactly this part of Canada's historic and beautiful landscape that we would recommend you explore. Either way offers you an alternative to the traditional drive and allows you time to watch nature unfold in front of you. ROCKY MOUNTAINEER RAILTOURS®: Travel through the Rockies during the day and sleep in a comfortable hotel for the night. The journey takes two days and is a little more money than the alternative. 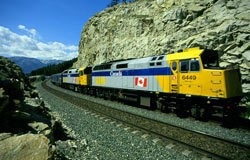 There are two classes onboard the Rocky Mountaineer known as Gold Leaf and Red Leaf. If you are interested in reallly apreciating the scenery, then the Gold Leaf seats are really the way to go. The dome coaches allow you to see the panoramic views of the mountains that you just don't get otherwise. VIA Rail: is the more budget-friendly of the two and all classes of seats have access to the dome coaches, although seating is limited. If you are only planning on spending a few days in the mountains, this is a great chioce. VIA Rail travels through the night which is also beautiful with Alberta's long summer nights. If you are lucky, you may even get to see Mount Robson, the highest mountain in Canada Rockies. The routing you chose is really up to you and your schedule. The nice thing about the Vancouver - Banff/Calgary (or vice-versa) is that there is access to an international airport at either end; in Vancouver or in Calgary. You will travel through the beautiful Fraser River Valley and pass through the historic gold rush route of the Fraser Canyon. You will continue on to the stunning mountain ranges of the Canadian Rockies and really discover why they are called "rocky"! Travelling to or from Jasper is also a great option. Jasper is tucked away in the Athabasca Valley and has a homey feel to it with cozy little restaurants of international cuisines as well as beautiful lakes and rivers and great hiking trails. Of course there is more to your holiday than just getting there, so figure out what sites and activities you are most interested in and decide on your routing. This "old-fashioned" way of travel will charm and inspire you - and you can pack up your memories and take them with you.